There was a debate as to whether the console should sit horizontally or stand vertically. That started right from the beginning. 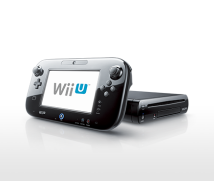 We on the mechanical engineering team started design of the Wii U hardware back around April of 2009. At first, we considered various configurations aside from the Wii-like horizontal types and square types like Nintendo GameCube. But pretty early on we settled on the Wii type. When we first announced it at E316 in 2011, a lot of people asked if it could be stood upright. A lot of people think of Wii as something that stands upright.16 E3 (Electronic Entertainment Expo): A video game-related trade show usually held in Los Angeles. Wii went out into the world with a mainly vertical design, so in order to create a distinction, we went with a mainly horizontal design for Wii U. But we have prepared a stand so that it can also stand upright. A big reason you could make Wii U that much more powerful compared to Wii at this size, was reducing the number of heat sources to one. 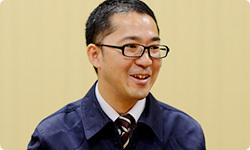 I remember Takeda-san saying rather early on that we should use an MCM. And we were also making something in an unprecedented way, where we combine various chips made by multiple semiconductor manufacturers into one package. Akagi-san, you were active in addressing the problem of how we could test the completed MCM. Yes. But I wasn’t the only one. The whole testing team worked together. It was my job to take the results and assemble them together into a final test image. To perform the tests perfectly, you have to spend time investigating all sorts of things, but when you do that, inspection equipment expenses and the time spent are reflected in the cost. There’s a contradiction there in that you have to find a way to test thoroughly but also cost-efficiently. Yes. The amount of time we spent testing early on was enormous and not commensurate to the cost. But when defects arose during testing, we had each person in charge analyse the contents of the defect and give feedback to the manufacturer, so we were able to gradually cut down on testing time. Had you built up know-how with regard to which places you should check carefully? Yes. Where defects don’t appear and where we have to be careful are clearly visible in test defect ratios. Statistically, we can decrease the number of test patterns for places that are safer, while maintaining more thorough tests for parts that have a greater frequency of problems. It’s important to vary test methods that way. However, even with that variation, as time went by, we encountered the problem of defects appearing in parts for which we had decreased the number of tests. 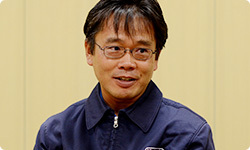 In co-operation with the manufacturers, the hardware team and Akagi-san’s software team analysed defects and provided feedback, in a loop like that, over and over countless times, shortening the amount of time. Having the CPU and GPU together took more time than ever to have it optimised. If they didn’t know the cause of the defect, those in charge would go around the manufacturers and look at the compatibility of each one’s LSI chip and reflect that in testing. Hundreds of times you analysed defects, imagined why they arose, ran and tested a program, and confirmed what actually happened. Yes. If a defect arises right away, that’s fine, but there were times like when we left the Wii U console’s power on for a whole day and then a defect arose! You ran what’s called an aging test17. 17 For this kind of test, a device tested at a constant temperature is placed under a burden for a long time, and its operation is checked afterward. Yes. If you don’t do that, defects will eventually arise when the product is in the customers’ hands. Toward the end of creating the product, a lot of tests that take a long time are left over, so it took an extra-long time to analyse each single defect. But this time, our partners were very positive about co-operating with analysis, which really helped. I think this is the magic of game consoles. 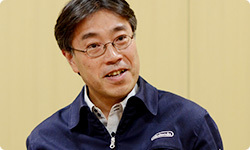 We carry out development together with other companies, but rather than having IBM employees and AMD employees and Renesas employees, we joined into what might be called Team Nintendo. That happened because it seems like they can talk to their families about what we have made. In that respect, one of the good points of game consoles is how the participants’ motivation rises for the team as a whole. Instead of just designing a GPU, for example, you’re making a game console. It’s interesting how even different companies can form one team. So when defects arise, we are blessed to have people who will take a personal stake in it and co-operate with us even if the cause doesn’t lie with them. Actually, a lot of the CPU and GPU designers this time have been working with us since development of Wii – which is a plus. They really like our products. Especially since Wii U had to be backwards compatible with Wii. Yes. The designers were already incredibly familiar with Wii, so without getting hung up on the two machines’ completely different structures, they came up with ideas we would never have thought of. There were times when you would usually just incorporate both the Wii U and Wii circuits, like 1+1. 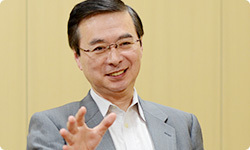 But instead of just adding like that, they adjusted the new parts added to Wii U so they could be used for Wii as well. And that made the semiconductor smaller. Right. And what’s more, power consumption fell. That was an idea that only designers familiar with Wii could have put forth. We were able to make such a small semiconductor because so much wisdom bubbled up!